My Key West-style home is remodeled throughout 'island style' in soft greens and corals; stainless appliances; granite counters. The master bedroom has a queen-size bed with extra luxurious mattress top and has a private bathroom. The guest room has two twin beds; and can convert to a king bed if needed, with a full bathroom for guests. The living room has 2 sofas for comfortable seating/ one is a queen sleeper. Enjoy views of the lagoon pool from the kitchen while preparing a meal or a drink. Dine in the screened lanai overlooking the pool or enjoy the sights and sounds of nature dining out on the brick patio. Pictures do not do my home justice, it is a little gem and my guests keep coming back year after year. Of course the highlight of my home is the pool, heated between 80-86 degrees year round depending on temperature outside. In winter unable to heat when temps dip below 60 at night. My home is surrounded by beautiful foliage..Coconut trees, frangipani, and jasmine surround the pool for peaceful surroundings, perfect for reading a book ,casual entertaining...and a perfect setting for your relaxation. The sound of the spa's waterfalls is heard throughout your day. Enjoy the hot tub in early evening with a cool drink. Hi speed internet,wireless, dvd and 3 tv's are in my home along with 4 beach bikes,coolers, large beach umbrella, beach towels and all the necessities for the beach. My home is on a 'beach access' street so no need to walk the highway to get to the beach. Our beach is seven miles long, and has a variety of beachside restaurants, live music, friendly locals and plenty of shops. Ft Myers beach has a variety of activites while you're here, whether its a boat trip, Sunset cruises, eco walks along the beach, kayaking, jet skiing, parasailing, Spas, all offered on our beach. You can walk to many of these establishments or enjoy a trolley ride to 'Times Square'. The 'pier' is a favorite place to gather at sunset while enjoying a cocktail...My home is only 1 1/2 mile to the pier. Grocery stores are within a mile of my home. Orlando is just three hours away, Busch Gardens is 2 hours away, and Sanibel/Captiva Islands , The shelling capital of the world is only 20 minutes away. ...and should you feel the need for some alligator sightings...well then Everglades City is just an hour 1/2 south.... Miami, one of the most unique cities in Florida offering a diversity of restaurants, art museums, cultural events, shopping and more....is just 1 1/2 hours away on East coast of Florida. Whether you are looking for a romantic escape or a family gathering, my home is a treasure waiting to be found...and you just might be lucky enough to be here when the banana tree sprouts its annual spread of tasty exotic bananas for your morning breakfast. If not, well then 2 grocery stores are 1 mile away! I am a business professional in the area, and work for a local TV station. I love Florida and spend as much time at my beach rental as possible! I love the beach and have lived in the area 25 years. Some of the best times I have had are walking and biking along the 7 mile Gulf of Mexico. You just never know what you will see! I have many many repeat customers and I hope you will be one of them. I can help you with travel ideas once you are here, so feel free to call me. Quaint, quiet, and relaxing vacation home! There are unique benefits to renting a private home, rather than a condo. You are on vacation so take advantage of it! Unique benefits to my home are privacy from the busy streets; peaceful setting; and the chance to have your own pool and spa without sharing with other condo guests. My home will feel like your own. I have made it comfortable for all .When you are in my home, you have a complete view of outdoors, and the pool area which makes you feel like you are living in nature; with all of the palm trees, frangipani and the sound of the waterfall spa....it is wonderful. You will not want to leave! Fully stocked with coffepot, toaster, blender, pots, pans, and utensils. Paved outside patio with partial shade if needed. Plenty of areas around pool in full sun. Heated pool; 80-88 (depending on outside temps). In winter when temps dip below 60 ,heat is turned off. This was a wonderful first VRBO experience. The house was clean, quiet and private. The pool was beautiful. Totally satisfied, much better than fighting the crowds at a condo. Comfortable accommodations for a family of 6 Two Adults and 4 teenagers A short walk to watch beautiful sunsets. Would highly recommend this house as a family get away. Next time in Fort Meyers the family plans on staying with Ann Marie. Thank you so much for visiting Ft Myers Beach ....and for taking great care of my home. You are welcome back any time! What a kind family you all are ... with a very special aunt for sure! Truly enjoyed our stay at this cute rental house . The home is very well kept and love the pool and spa. Loved the short walk to the beach and to the store. Enjoyed the lanai and the kitchen was well stocked with dishes and utensils for cooking. Is not quite great for 6 adults to sleep as the sleeper sofa is not that big. Advertisement stated two double kayaks but only one available. Also stated 4 bicycles but not all in working order. Would be great if there were a few more beach chairs but we survived. All in all, it was a great value for the money. Great location. Close to beach. Walking distance to fun places or use provided bikes to get there quicker. Thank you for the kind words , yes my location is perfect ; only 1 1/2 miles from downtown, yet a quiet neighborhood for relaxing. Thank you for visiting. 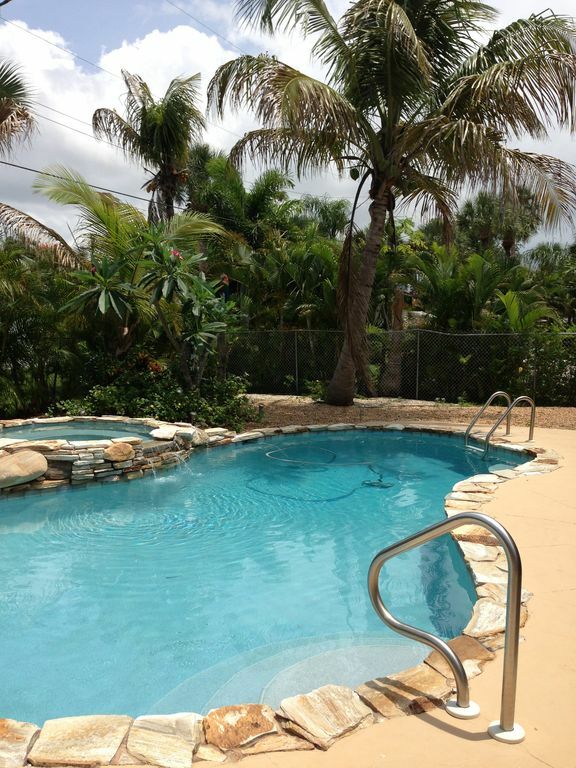 Lovely home just steps from the beach, with a private pool and a screened lanai. Great place to escape the cold northern winter weather. Thank you Nancy , I always appreciate having you visit every year! Yes you lucked out this Feb with the Best weather ever!! Thank you ! See you again soon! The cool FL temperatures didn't keep us from playing tennis every morning. Even when we woke to 48 degrees, we went to the courts and found 8 of our tennis buddies already there. We spend a couple of weeks every winter in FMB and always have to rent bikes, so it was so convenient to have Ann Marie's bikes available to get us around. A mile biking to the courts warmed us up to play. The house is lovely, everything we needed and decorated very nicely too. The beds are comfortable and the shower has hot water and a choice of pressures. We ate in often since the traffic was particularly brutal this year, and the kitchen is well equipped and we could bike to Publix less than a mile away. The only thing we would have liked to have is stronger lights for reading. Ann Marie was always available by phone throughout our stay, and met us when we arrived and gave us a thorough intro to the house, with instructions for the heat (we needed it) and AC, how to get the pool covers on and off and adjust the valves for the spa. The outside area offers both a filtered sunlight section and bright sun with lounge chairs and is fairly well protected from the wind. The spa in the afternoon was great for our sore muscles. We have always stayed north of the library before, so I thought I'd try south this year. We found the restaurants in the southern section of the island to be on average more expensive, but liked the Big Hickory Grill and we always visit Charlie's Boathouse Grill. It also put us closer to Naples Botanical Garden, where we spent a lovely afternoon following our only rainy morning, with dinner at the Naples food trucks by the water which was a serendipitous find and kind of fun. The beach is much quieter than in the northern part of the island. Wonderful for walking and shelling, fewer lights and less noisy for moonlight strolls, but fewer choices for grabbing a quick bite to eat. All in all, we really enjoyed our stay and would recommend it highly. Yes the bikes are really convenient and saves you money in having to rent them elsewhere all week. You were terrific guests and I hope to see you next January!! Very clean, great location, pool and hot tub fabulous. Ann Marie is friendly and helpful. Excellent location. Very helpful to have the use of the provided bicycles. We used the pool and hot tub every day. Close to the beach access. Excellent stay. Would definitely stay at this house again. Thank you Gina for your kind comments. You are terrific guests and thank you for staying at my home. I try to improve my guests vacation, and your feedback is important to me! I look forward to seeing you again! Everglades boat tours, Snorkeling in the keys (2 hours away) Deep sea fishing, Shelling, Outlet shopping, People watching at the Pier, Restaurants, Edison Ford Estate Home, Lovers Key State Park, Kayak and Canoe rentals, Dolphin tours,Bird Watching, Germain Arena for concerts, The Philharmonic, Barbara B Mann Performing Arts Center, and RELAXING!